The day after Christmas (what we Canadians call “Boxing Day”), when many people were out snagging deals with post-Christmas sales, I snuggled in with a cup of tea and my two dogs to watch No Impact Man. I am late to the party when it comes to this documentary, as it was filmed and released in 2009, but I still enjoyed it and the principles behind the project. For those of you who haven’t seen the movie, No Impact Man is about a small family who spends a year trying to live “no impact”. They live without generating garbage, without using electricity (for a portion of the year), and without buying anything new. It is a project to see what they can do to cut back on their environmental footprint going forward, and it is also an effort to inspire others to do the same. Some of the things that the family did were things that I’ve made a concerted effort to do for years, and some of them are things that I am trying to change going forward. The family in the documentary was what many Americans might consider “extreme”, as they only shopped at a farmers market which sold locally sourced food (cutting back on the emissions from transportation of food as well as the chemicals required to preserve the food in transport). However, one of the easiest ways you can cut back on the amount of garbage that ends up in the landfill because of you and your family is by bringing fabric, re-usable bags when you grocery shop. Plastic is terrible for the environment and our ecosystem. 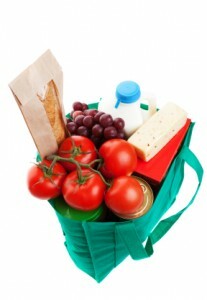 Many grocery chains have started to charge a small fee for plastic bags, too, and your savings can add up over time. Eating out and getting takeout is the plight of our generation. I remember when I was a kid, we ate out maybe once per month as a treat to a local Chinese buffet (we lived in a small town, it was the only restaurant that my mom liked). As an adult, I eat out at least twice per week, including grabbing something through the drive thru on my lunch break. Every time you eat out, not only is it a colossal waste of money, but you are also adding a ton of garbage to the environment. The paper/plastic bags that your take out comes in, the individually wrapped food in plastic or styrofoam takeout containers, and the straws, napkins, plastic forks, knives, spoons, ketchup/soy sauce packages – they may not seem like they add up to much when you’re consuming, but it really does. I was watching Nanny 9-11 the other day (it’s such an interesting show!) and I noticed that in many of the episodes, families use paper or plastic plates for their meals instead of real dishes. This blew my mind. Yes, it requires less cleanup at the end of the day than dishes, but it’s SUCH a waste. It’s a waste of money, a waste of resources, a waste of perfectly good trees. Not to mention the fact that it’s just lazy! For a small family of four, if you had dinner every night using paper plates, you are disposing of 28 paper plates per week for just your evening meal. That’s almost 1500 paper plates in a year. That’s nuts! I didn’t even know this was a thing until I started paying more attention. Starbucks, Tim Hortons, and other coffee shops are some of the worst culprits for waste. Not only do you have the cup and the plastic lid, but you are usually taking a sleeve or, if they don’t have sleeves, double cupping the drink. Not only will you be cutting down on your footprint if you stop with the excessive waste by using paper cups, but you also will save a bit of money by bringing your own mug. Many coffee shops will give you a discount which adds up over time. These aren’t huge changes, but they will help your bottom line and the environment. When you go to use one plastic bag at the grocery store and write it off as a one-time thing, think about how many of those “one-time things” you do over the course of the year and the impact it has on your health, your families health, and our lands and oceans. Great tips Daisy! It really is saddening how much waste we produce every year and how careless other people are when it comes to saving our environment. Thanks Mark. I think so, too! No impact man is on my Netflix queue, I believe. Will have to watch that one! It’s an interesting documentary, I’d recommend watching it if only for the message behind it. I think NYC is actually banning styrofoam take out containers. I try to take cloth bags grocery shopping but then I always run out of bags to take my recycling out in. That’s wonderful! I think all cities should do that. Do you have plastic bins for recycling? That’s what we use. I’m doing better about using reusable bags since they charge 10 cents in SF now for any kind of bag. I am trying to be better at buying less produce and eating it fast so it doesn’t go bad. I still have a squash and sweet potato from a while ago that I need to bake. I wonder how long they can last lol. Squash tend to last quite a while in the right setting, so you should be good for now! I wrote a post once on a family I know that uses paper plates and plastic almost consistently. I think I figured out once the difference between the added cost vs. convenience factor. I go food shopping at a store that allows you to take the packing boxes to hold food in; and I take about five or six cloth shopping bags along as well. Why waste plastic on so much junk? Never did get that. Starbucks allows you to bring your own cup? Sorry I just found that amazing. One thing that I think people don’t realize with Chinese take-out; those little boxes unfold into paper plates. Do you remember the days when McDonald’s used styrofoam for their burgers? In Canada, Starbucks allows you to bring your own cup – maybe that’s just in my area but I don’t think so. I don’t remember that! McDonald’s is the worst.. Sounds like an interesting film, I’ll have to check it out. We always try to take our own grocery bags, and they are planning to introduce a charge here in the UK for each bag you use at the store – it’s already in place in Wales and is having a really big positive impact – it’s all about changing peoples habits. Thanks for the tips!